Why is my Shea Butter Gritty? One of the most incredible feelings of success is learning how to DIY many of your personal care products – from body butter, to facial cream, perhaps even your own bug spray and deodorant. I am all too familiar with that feeling of pride when you start wiping out all the toxic household and personal care products you own in favor of DIY’ing as much as you can. Once you start to DIY, your cabinet quickly fills up with everything from coconut oil to beeswax, citric acid, baking soda and even Shea butter. Shea butter is pretty incredible stuff – it whips up to the most beautiful silky body butter you could ever image – in fact, it’s also an ingredient in our facial cream, too. There is one tiny thing that I despise about Shea butter.. and that is grainy and gritty Shea butter. It happens to everyone — whether you buy refined or unrefined Shea butter. Chances are, the more that you have purchased the more you have had the same experience as we have – perhaps you made some incredibly soft and luxurious body butter only to discover it as gritty and grainy several weeks later. Why is your body butter gritty? Was it bad? Did you do something wrong? Or was it a bad batch? Maybe you think that you bought the wrong kind of Shea butter – perhaps you should have went with unrefined Shea. Gritty body butter is the result of temperature, and only temperature malfunctions. Skin butters like cocoa butter, Shea butter, all have their own respective melting point. Shea butter happens to have a low melting point of room temperature. When you buy Shea butter online, depending on your area, it may melt while it’s being shipped to you (here in Arizona it gets quite warm in the summer). If it melts, and then cools, the fatty acids in the Shea butter become more solid than the actual Shea. Shea butter also has stearic acid – and stearic acid has a very high melting point which really makes it challenging to use for DIY’s because of the texture. Shea needs to keep a consistent temperature to avoid becoming grainy. What if your Shea becomes gritty? One of the biggest problems with using Shea is having to deal with that gritty texture. That gritty texture is the result of uneven heating and cooling of the butter during your DIY. The best way to deal with the possibility of gritty Shea is to melt it down using a double broiler – slow and low. Once you melt completely, allow to keep at that melted point on the lowest heat for 20 minutes – that will ensure the grains have also melted since they have a higher melting point. Once it’s completely liquified, freeze it until it turns solid — and then pull out of the freezer and keep at room temperature. If your temp is above 75 degrees F, then move it to the refrigerator to avoid the gritty texture from coming back. If you remove from the freezer and the room temperature is warmer than 75 and causes some to melt, the gritty texture will come back. If you have already made a DIY and found that it is grainy, simply go through the process again of melting and cooling – don’t give up! Shea is tricky to work with – but if you keep these simple tips in mind, then you will find yourself successful in your DIYs. 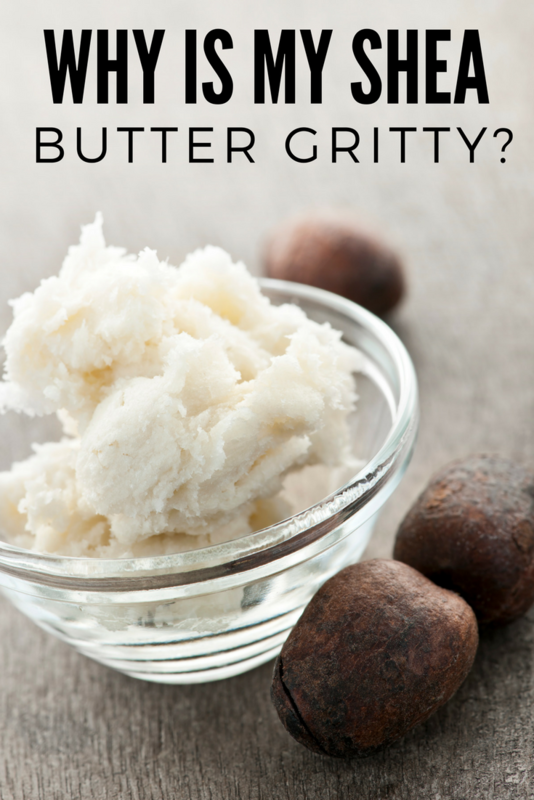 Share the post "Why is my Shea Butter Gritty?"